Having good quality fresh water is essential for your Homestead. Water is essential to life. You will not be able to survive on a location without water. 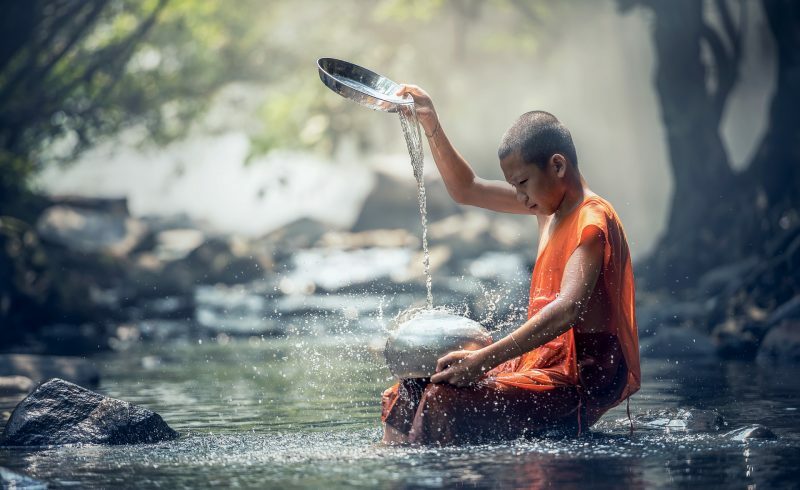 Water is needed for cleaning and drinking, for us humans and for our animals and plants. From our experience we know how essential it is to find a location with sufficient water. In this blog you will find the information you need to find a Homestead Location with good and sufficient fresh water. How much water do you need to run a Homestead? How do you know whether the location you want to explore has enough water? 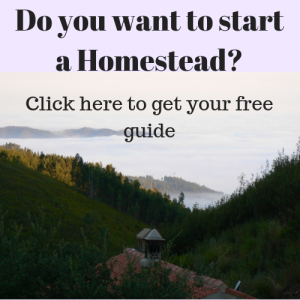 Find out more about what it takes to start a Homestead. Rainwater that is collected: rainwater can be collected on a roof or any other clean flat surface. This rainwater can be stored in a big tank for use. Surface water: spring, creeks, rivers, lakes: water from these resources can be stored in a tank for use. Water that is pumped up from deeper level through a borehole: in some areas there will not be enough water on the surface or not be sufficient rain. There can be underground sources like an aquifer. You can tap into these aquifers by making a borehole and using a pump to pump the water up. The grid: some places will be simply connected to the grid of a town or village. You will need one of these resources on your homestead as a basic minimum. It will be securer to have more resources available at the same time. Treated fresh water of a good quality for your household and for animal husbandry. Untreated fresh water for irrigation. This water does not need to be potable but still needs a good quality for not poisoning your crop. When your water resource provides a good fresh water quality you can also use the water for animals. How do I know how much water I need? From your water bill you can easily read how much water you are consuming. The amount can be rather shocking. Are you going to use the same amount of water on your homestead? You might. When you think that you can bring down your water consumption try it while you are still where you are. This way you can practice and see where you will end up when you do your best to save water. Doing so you will know what the minimum amount of water needed for your household will be. It will also be useful to figure out what uses most water. Now, your household will be one thing. Running a homestead with trees and a vegetable garden will be another thing. You might even want to keep animals that will need water too. A Homestead household will most likely use more water than an apartment. The irrigation of a vegetable garden and trees takes much more water than a household. That does not mean that the ecological impact of living on a Homestead is bigger than of living in an apartment in a town. A lot of the water consumption of living in a town is hidden and not direct. The vegetables that are consumed in an apartment were watered too. It just does not appear on your water bill. Any way, the thing that is important to know is that you might use more water for your Homestead then what you would expect. The amount of water that you will need in your orchard or garden will depend heavily on the climate that you will be living in with your Homestead. In Holland, which has a temperate climate we would never water the fruit trees. In Portugal, where we live now, in summer we have to water the fruit trees twice a week. Portugal has a mediterranean climate. The amount of water that you need depends on the annual rainfall and evaporation. In Holland it rains all year round. There are some exceptional year in which you might have to water your orchard. But it never used to be the standard. In Portugal it rains during the winter and the summers are dry. The evaporation in summer will be much higher than in Holland because the temperatures in summer are much higher in Portugal. That is why we need to water the trees in summer in Portugal. For the vegetable garden it is a bit different. We did water our vegetable garden in Holland sometimes. In Portugal we water it a lot. The climate you will be living in will be the main influence on the amount of water that you will need for your Homestead. However the soil will be of an influence too. Sandy soils will consume a lot more water than clay-loam soils. How To Analyzing The Soil From Your Vegetable Garden. Here in Portugal each tree, each time, gets something like 20 l (two buckets). When you have 100 trees it means you will need 4000 l a week. The summer without rain lasts up to 5 month. Well, that is about 80.000l of water in a summer. If you would use rainwater catchment in Portugal, you would need a tank of 80 m³ to collect enough water for the whole summer, to provide that amount of water. Since we have a small creek that flows the whole summer we can use a much smaller tank for daily use. Our irrigation tank for the vegetable garden and orchard is 6 m³, we empty and refill the tank twice a day. The size of the tank that you will need depends a lot on the inflow and use of water. I do not have measured figures of what our vegetable garden needs but this is my estimate: 6 m³ per week for about 400 m². That is another 120 m³ added for the whole summer. I am sure you can bring this number down by watering more efficient, which we will do in the future. Still if you could bring the number down to halve, being 60 m³ you will still need 140 m³ of water for the orchard and vegetable garden together in a summer for 100 fruit trees and 400 m² of vegetable garden. This is just to indicate that you will need a lot of water when you are growing things in a Mediterranean climate, which usually has wet winters. You will need a serious water recourse to run your homestead. Especially in areas where there is a high evaporation in summer. It is important that rivers and creeks run all year around, especially in the summer month when you need most water. A small creek like we have can be enough. Water from some lakes can be used as fresh water. You might be lucky to have excess to such a lake. Lakes however have to be big. I am not talking about something the size of a big pond, but a real huge lake. The water quality of big ponds can be very questionable for fresh water use. However some big ponds size lakes can function as a rainwater collecting tank. This water can, in some circumstances be used as fresh water when treated. Rainwater collection can get you a long way, but you need to be sure that there is enough rain in the climate zone you want to start your homestead in. Since the weather is never predictable years ahead I would never solely depend on this water recourse, but combine it with other resources. Important is also that you have enough surface to collect the water and a tank that is big enough to store it. Our neighbors are very happy with the rainwater collected from their roof during winter. They store it in a big tank below the house. The collected rainwater is enough for the household in most years, but never enough for irrigating their orchard and vegetable garden. For the location you want to buy, you will have to check the annual rainfall to know whether you will have enough rain for your household. Don’t forget these are averages over many years. So there will be years with more or less rainfall. Concerning boreholes you have to measure if they deliver enough. Boreholes can also run dry depending on the source they tap in. Especially when they are not deep enough. Borehole pumps can break and they are costly to replace. When you have to make a borehole check what the costs are, it can be very expensive. I personally would avoid having a borehole. But maybe you do not have a choice. A grid would most likely provide you with enough water. But it is better to check it out. Water from the grid can be cheaper then having your own water. This will not be true for all areas in the world. But it is for us. The water quality of our creek is very high. However we do need even higher standards for drinking water because we have a rental place on our land. We rent out a holiday house during the summer month. This requires a licence on the water quality, meaning that we need some expensive filters to make top quality drinking water. Although it sound romantic to have your own fresh water resource, making your own water filter system work can be quite an effort and costly. Water from the grid might not sound “homesteady”, but is definitely worth checking out. If we would have excess to the grid I would use it. This would have made our renting out a lot easier. Water in coastal areas can be saline even when it comes out of a borehole. With an increasing water usage in a coastal area, fresh water levels can drop. This can result in more salt water from the sea pressing itself into the underground. Even some inland areas can have problems with salt water in deeper levels. I areas where hardly anything wants to grow, salt water can be a problem. Another mineral that can decrease the water quality is iron. You can recognize this when a creek has loose rust colored flakes at the sides. This means that the springs can contain water with a high iron level. This problem can be solved, but it would be better to have a none ironed source as well. On our land we have a spring that contains iron, we will only use it in case of emergency. It needs to be heavily filtered. The filters need a lot of maintenance. Normally we use water from a clear spring or from our creek. Water pollution can also be a worry when choosing a site. You will actually have to take a look at the creeks and lakes near the site you are checking to know. Water from resources can be best tested when in doubt. There are some do it yourself kits on the market to make a quick test on chemical pollution. We have talked about the main resources of water that you can find for your homestead. From there we looked into the amount of water that is needed to run a homestead and also how you can recognize whether a site has enough water for your needs. We briefly looked into some water quality issues. Seen from our experience, these are the main things around the topic of fresh water to consider when you are looking for a Homestead. When you still have some questions about this topic please leave a comment below in the comment section. We will try our best to help you out. Tom kent me wellicht nog wel, Huub Neys uit de tijd van de ‘Gelatties’. Ik volg jullie blogs al een tijdje. Altijd leuk en interessant om te lezen. Terug naar de blog: bij elke overweging van Monique in die bewuste blog moest ik denken: dat probleem is automatisch opgelost als je met een groep (10 tot 150 mensen) woont. Je kunt dan heel veel dingen voor elkaar opvangen. Probleem is echter altijd dat het dan wel moet klikken met die andere mensen. En dat hangt weer samen met hoe je zo’n groep opzet en wat de doelstellingen van die groep zijn. Mijn vraag is daarom: hebben jullie daar ooit over nagedacht of het zelfs geprobeerd? Dus om met meerdere mensen jullie homestead uit te bouwen? Groetjes en veel succes! Huub. Dank je voor je reacties. Tom heeft me wel eens over jullie verteld. Hielden jullie geen beesten? Ik ben in mijn tiener jaren ook nog eens on Yogyakarta geweest,ik vond het daar erg mooi. Wat leuk dat je rond bent wezen reizen in de VS en in Europa om leefgemeenschappen te bezoeken. Misschien vind je het leuk om een keer iets dat je geschreven hebt op te sturen. We hebben het hier wel overwogen om mensen bij het werk op de boerderij te betrekken en ook wel mensen hier gehad voor een tijdje. Het werk is best zwaar en daar knapten de mensen die hier waren wel op af. Er is echt een hoop commitment nodig. We merken ook dat mensen vaak liever hun eigen ding willen beginne in plaats dat ze zich ergens bij aansluiten. Het lijkt een beetje een trend. Onze collages homesteaders in de buurt die op zoek zijn naar mensen die bij hun willen wonen merken het ook. Een ander ding wat het niet makkelijk maakt om de Homestead te verbreden naar meer mensen is dat het op dit moment niet zo makkelijk is om op het land bij te bouwen. Maar je weet natuurlijk nooit misschien lukt het nog wel een keertje.